Great home for soaking up the sun and fun of lake front living. Stone patio, barbecue area and second floor deck provides the setting for spectacular westerly views. Wood floor - open concept large living room, dining room and gourmet kitchen. Plenty of windows to bring the outside in. Friday to Friday check in / check out dates during July and August. Month to month October 15-June 15. This is our home. We are looking for people who will appreciate its beauty and respect the home and neighbors. Ideal for those looking for a quiet get-away. Not Your Typical Rental! Exceptionally well designed 3364 sqft' home offering all the qualities of the quintessential lake house combined with today's most sought-after luxury amenities. Extensively renovated and tastefully decorated, the main house provides lateral living on one level typically unavailable on Lovell Lake. Ideally situated on its own small peninsula, this unique property features a level waterside lawn with no immediate neighbors creating just the right mix of privacy and sunshine. 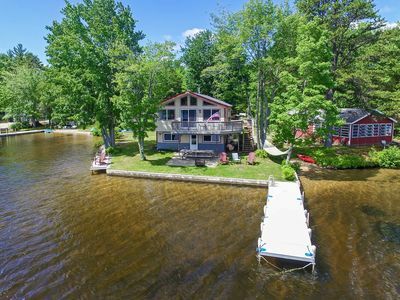 Complete with the prerequisite small sandy beach providing easy access into the lake and a deepwater swimming raft for real summer-time fun. Imagine pulling your watercraft into the boathouse and stepping off into this truly magical home. For complete details prior to requesting a reservation, please review the Sample Lease Agreement. Relax and enjoy plenty of chaise lounges, adjustable beach chairs, an oversized picnic table with a large umbrella, plus stackable Adirondack chairs for easy movement around the yard. The level lawn is perfect to launch your kayaks and canoes into one of New Hampshire's cleanest and quietest lakes. You're even able to fish right off the lawn into one of the lake's hotspots. Equipped with a stainless steel gas grill including all the necessary tools for outdoor cooking, plus a fixed firepit for an evening of storytelling, s'mores, and stars galore. Sanbornville is a very small lake town nestled on the border of NH & ME, conveniently located only two hours from downtown Boston. 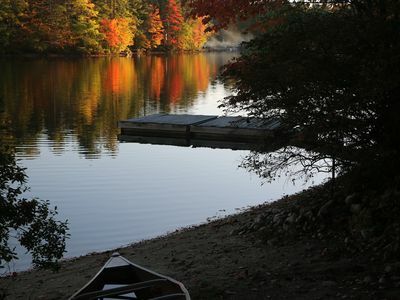 Lovell Lake has been designated as a "Tier 1" Body of Water by the State of NH. This extremely comfortable home offers a large living room with floor to ceiling windows, leading to a beautiful screened-in glass sun porch with views of the lake and spectacular sunsets. The open concept kitchen is well-equipped including full-size stainless steel appliances and all the kitchen tools you'd expect to prepare and serve your meals. The island is great for casual breakfasts, lunches, snacks, and suppers. The sun porch doubles as formal dining with seating for eight. There's also a separate family room with plenty of comfy seating and a large flat screen Apple TV, board games, a wine cooler and prep bar for cocktail hour. Please view the Floor Plan. The two master bedrooms with very comfortable king-size beds are both located on the main level each with their own full bathroom. Both bedrooms are outfitted with comforters, pillows, and fresh linen. The full-size bathrooms both have shower stalls and are outfitted with plenty of fresh towels. Enjoy a true separation of space with the two master bedrooms at opposite ends of the house providing excellent privacy. There's also a fun bedroom with a real mattress murphy-bed overlooking the boathouse, and a convenient half bath off the kitchen. Maximum occupancy of 10 people is somewhat flexible? Please message me. The Camp (not to be confused with roughing it), located above the oversized garage offers those families looking for even more separation of space with over +-650 sqft' of additional fully renovated living quarters. Featuring its own family room including one bedroom with a queen-size bed, a den with a king-size bed, full-size bathroom, large closet, and a kitchenette with a sink and mini-fridge. Both of the beds are outfitted with coverlets, pillows, and fresh linen. The full bathroom is equipped with a tub/shower and outfitted with plenty of fresh towels. This mini-apartment is complete with a flat screen TV, central air conditioning, fun shag carpeting, skylights and plenty of windows bringing in great light. Guests of all ages love this very cool space. This pristine home is complete with central air conditioning throughout, skylights, full-size laundry, Apple TV, wireless internet, surround sound, a two car garage plus ample outside tandem parking, and extremely well-maintained grounds. Just minutes away you'll find the local grocery, hardware, casual restaurants, ice cream shop, playground, hiking trails, public library, post office, auto service, full-service bank, and the town public boat launch. 15-30 minutes away you'll find farm stands, boat rentals, marine services, medical centers, massage therapy, golf course, major retailers, and more. If you're considering leaf-peeping or spring and fall fishing trips, this area of New England is a terrific choice at a great price. Conveniently situated on the border of New Hampshire and Maine for lazy day trips, or just relaxing in a peaceful environment. During the spring or fall seasons, this beautiful vacation home is tranquil with few neighbors, perfect for a week of boating, kayaking, and canoeing. Regional attractions include the White Mountains, Lake Winnipesaukee, Main coastline, State Parks, hiking trails, and more. The three-season glass sun porch is still warm and cozy, and the wood stove in the living room keeps the chill of the main house, with central heating throughout. The lake offers the smell of spring in the air, stunning fall foliage, and spectacular sunsets. Good To Know: We're searching for responsible guests like you who will respect our property. Our neighbors keep an eye on our property, and our handyman lives on the lake readily available. In turn, we sincerely hope our property meets your expectations and that you may want to return next season. For complete details prior to requesting a reservation, please review the Sample Lease Agreement. Once you have a confirmed reservation, I'll send you an email to schedule a brief telephone conversation prior to signing the Actual Lease. Historic home surrounded by white painted homes with picket fences and open fields in the quintessential village of Sanbornville. Step into yesteryear with all the quirky original doors and hardware, wide planked wood floors, steep staircase and a fireplace in your own room. A short walk to the infamous Wakefield Inn for fine dining. The bedroom consists of a queen size bed, comfortable linens and electric blanket, desk and dresser. Air conditioned in warmer months. The bedroom is located on the second floor of a historic home. There are two windows with views of fields and stone walls. Outside of the bedroom is a carpeted private sitting room with original beams and the bathroom is off of this room. The bathroom is small with a standing shower. Towels are provided. There is a hairdryer and soaps. A coffee machine, fruit and muffins are provided. Not a full breakfast. Boat House Cottage On Great East Lake. Lakeside living at its finest! Beautiful home situated right at the water’s edge on Great East Lake. Breathtaking views from the wrap around deck or the sandy beach. Private dock and mooring. Gorgeous sunsets. Oversized lot with a large green lawn. Newly renovated, fully equipped kitchen. Newly renovated bathroom. The property has a private dock to accommodate a boat up to 24'. The public boat launch is just a half mile away and there is room to park your trailer is the back of the yard. Quiet setting on beautiful Great East Lake. This is a perfect option for a small family or two couples. The cottage is a private stand alone structure nestled in a woodland setting with a full kitchen, cozy living area and private bath. All four cottages and the main lodge enjoy wonderful views of Great East Lake from the privacy of your own space or join in community events just a short distance from your back door. Outdoor Events might include sailing the 2 sunfish, paddling the 6 kayaks or 2 SUPs (stand up paddle boards), playing volleyball, basketball, badminton, bean bag toss, or swimming, snorkeling, fishing, and floating. The game room offers ping pong, pool, cable TV and a great place to relax and read a book or play a board game. 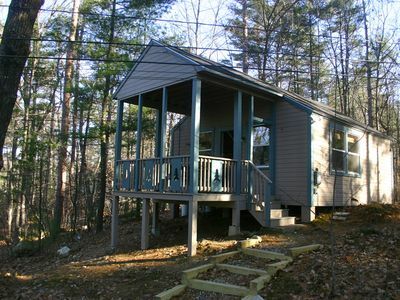 New Hampshire Rental Operator License #054360 Please inquire about accommodations for larger groups. Check HomeAway #367203 & #953896. Smoke Free - both INSIDE & OUTSIDE FIREWORKS are prohibited due to the high risk of fire and personal injury. Within a 45 minute drive, you can enjoy a scenic drive and hike along the Kangamangus Highway, hike Mount Washington, bring the kids to Storyland, visit the Hertiage Museum or have a splash at the water park in Portsmouth. After all the day's activities, nothing beats relaxing around the fire pit and tasting smors over a roaring fire. Great East Lodge is a waterfront retreat perfect for a large family, a group of friends or a romantic retreat. The living room has a 50' flat screen TV and DVD while the kitchen is updated with stainless steel appliances. A full size washer and dryer are available for use during your stay. Two master bedrooms each have a queen size bed, the third bedroom has two full size beds and the fourth bedroom has two sets of bunk beds. The lodge has a private waterfront patio with dining area where you can enjoy sunsets. Your time can be as active or relaxed as you like. Just outside your private home is a host of activities shared with the four cottages that comprise the property. You can sail the 2 sunfish, paddle the 7 kayaks or 3 SUPs (stand up paddle boards), swim, fish or play basketball, volleyball, badminton or bean bag toss. The boathouse offers ping pong, pool and a great place to relax with a book or play board games. Smoke Free - INSIDE & OUTSIDE Fireworks are prohibited due to the high risk of fire and personal injury. 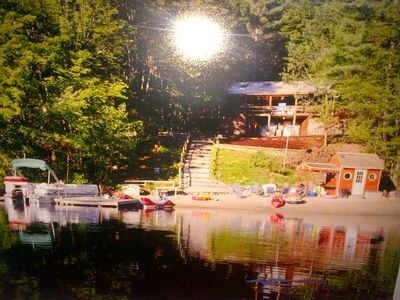 New Hampshire Rental Operator License #054360 Larger Groups: Please call about accommodations for larger groups. See HomeAway #953896 & #366812. 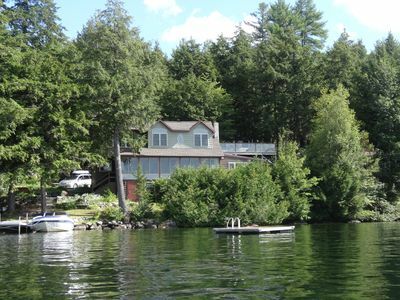 Two story Swiss Chalet type home on Lake Ivanhoe in the NH lakes region. Rustic setting includes newly installed wood flooring, private child safe beach, pier, two kayaks, grill, one acre wood lot, walk in basement from beach area, large master bedroom will accommodate additional guests, two decks to enjoy morning coffee, lunch, or dinner. Country store nearby. North Conway attractions, shops, restaurants, hiking approximately 45 minutes away. Lake Ivanhoe sandy beach oasis! 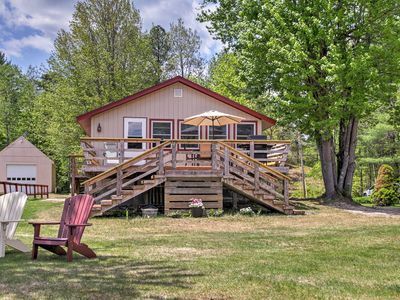 .This cottage has everything you need for a perfect lake front getaway. Kitchen with stove, fridge, microwave. Three bedrooms in total. Lake front bedroom has a queen size bed with a large picture window overlooking the lake. The second room also has a queen size bed. The third bedroom has full size bunks for the kids to sleep comfortably. The open concept dining and living room has a large flat screen TV, pull out sofa, and dining table. Oversized deck in the front overlooking the lake with a patio table. 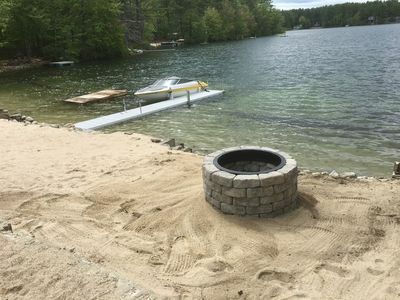 Sandy beach has a fire pit and dock and crystal clear water. For the times when you just don't feel like cooking, there is the Blue Bay Seafood and Steaks Restaurant and Bar less than a half mile away on Province Lake Road. Plus Jim's Wheelhouse Pizza in the same area. The Knotty Pine Restaurant and Poor People's Pub are 10 minutes down the road. There is also the Country Goods and Groceries store less than a half mile away on Province Lake Road, which sells pizza and subs and has all of your grocery needs, along with beer and wine and some of the best ice cream in the area! The New Deal grocery store and gas station is in the same area. If it's a great breakfast you want, try Cindy's just across the street. The lake isn't just for summer vacation. There are many antique shops to explore, fresh fruit to be picked at local farms, and leaf peeping in the Fall. These all make for fun family day trips and memories to last a lifetime. We are approximately 45 minutes to North Conway. There, you can shop the many outlet stores, and other local hand-craft, antique and gift shops, ride one of the area's scenic train rides, visit the many family attractions, such as Story Land and Santa's Village, and ski at one of the many resorts in the area. If it's golf you enjoy, Province Lake Golf Course is just a 10 minute scenic drive away. There you can enjoy a round of golf, then dine at The Restaurant at Province Lake Golf located in the clubhouse. You can travel to North Conway or Lake Winnepesaukee for the day! Come enjoy our home away from home, create wonderful memories and see why we fell in love with peaceful Lake Ivanhoe. Year-round home with 100' waterfront and 24' dock in wooded lot on Lake Ivanhoe. Hear the loons and enjoy the wildlife. Great fishing lake. Relax from the deck, dock, raft, or child-friendly, walk-in sandy beach. Open floor plan with windows that overlook lake but are surrounded by trees for natural privacy, and perfect southwestern exposure. New dishwasher, new gas stove and new refrigerator. New wrap-around deck. New hardwood floors, working fireplace and ceiling fans in big bedroom and main room. King bedroom and two twin bunk beds upstairs. Rest of lower level has third bedroom with king bed, and a large TV room with two sofas and half-bath, and walk-out to lake. Gas grill, fire-pit with 6 chairs and free WIFI. 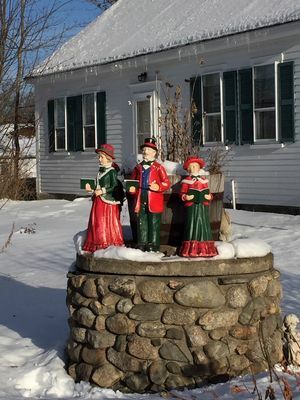 Town with welcoming restaurants and full supermarket is 5 miles away, North Conway & White Mountains are 45 minutes Enjoy nature and the slower pace from a comfortable home! I’ve done my best to make the house comfortable and easy to use, but it was built in 1970 to be a summer lake house. The house just has some quirks that are to be expected, such as sticky windows. That noted, guests have shared with me many positive reviews. NOTE: cameras are use in the driveway and inside utility room for safety and in case of any mechanical problems, but there are no cameras in the living area or beach area. 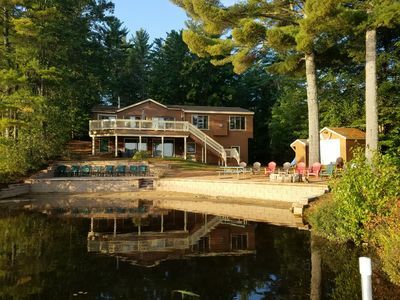 Come to relax and enjoy our beautiful, spacious waterfront home on crystal clear, serene Pine River Pond (600 acres mid-size lake). Our home will easily accommodate two families. Come create many years of lakeside memories!!! Enjoy comfortable meals in a spacious kitchen with granite counter tops, stainless steel appliances, everything you need to make a simple meal, or prepare a gourmet feast for your friends. The open concept allows for easy entertaining, or a quiet night enjoying the sounds of the lake. Imagine sitting on the top deck, enjoying your morning cup of coffee, looking at the gorgeous lake and mountain views. The flat, level walk from our home to the water is 50 feet. 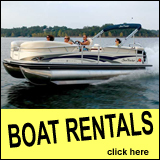 Launch your boat from our private boat launch and hook your boat to a 3 boat docking station. 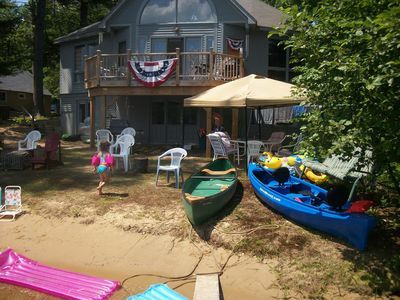 There will be a Canoe, Kayak, and Paddle Boat for your family’s enjoyment pleasure. Our home has all the modern comforts and amenities, 4 Bedrooms, Sleeps comfortable 12, and 3 large Bathrooms. Nice furniture, beds, linens, 2 Wood burning stoves, Laundry room, 4 TV’s, and a remarkable, spacious lower level Rec/Family Room with pool table, games, 50” 4K TV, and an amazing lake view from every level of our home. Large Master bedroom and guest room on 1st Floor, 2nd Floor has office/bedroom, and a very large Bunk Room. There are blow up beds, and lots of room to relax and forget your worries! Enjoy swimming, boating, water skiing, fishing, sunbathing as well as the best view of the sunsets from the dock or swaying on the hammock as you watch a game of Horse Shoes. 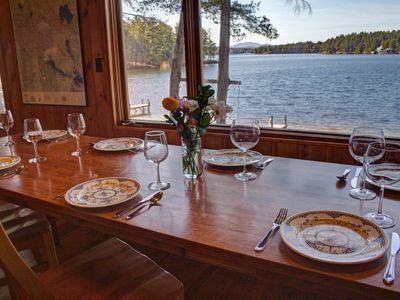 On most evenings and mornings, you'll be serenaded by the sound of the Loons on our lake. At night enjoy the outside fire pit; making s’mores, or just star gaze at the beautiful evening sky, you may even catch an occasional shooting star. Golf, skiing and hiking are less than 20 minutes. Snowmobile trails (Seven Lakes Snowmobile Club) right near our property. North Conway outlet shops, Storyland, the White Mountains are 45 minutes North, Wolfeboro and Lake Winnipesaukee 20 minutes East, Horseback riding, and Province Lake Golf Course is 15 minutes away. Also, within an hour are the well-known gorgeous northeast quaint beaches…Portsmouth, NH, Wells, and Ogunquit, ME. This can be your upscale vacation home; a place to make many cherished family memories; a place you will want to return to year after year! You'll be sure to truly relax on this vacation!!! Lakeside 4 bedroom house wIth GREAT views. 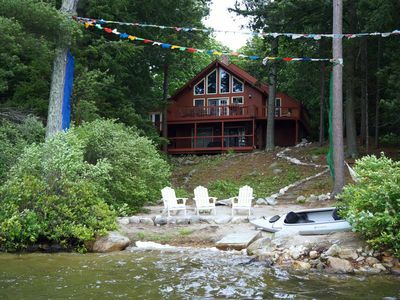 Lovely lakefront log cabin home in picturesque Wakefield, NH with 100'+ sandy beach, on a peaceful cove on clean 700 acre Balch Lake. Two private bedrooms, a lovely loft, (all with queen beds and doors), a downstairs 'Kids Kabin' with 3 daybeds and 3 trundle beds sleeping 6. We also provide an add'l. mattresses and cot. 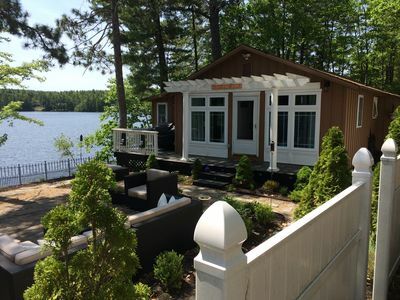 We have 2+ baths, with two propane fireplaces, an outdoor hot tub, a covered outdoor deck looking out over the lake with a Weber gas grill, & a Tiki hut on our 100’ long private sandy beach. 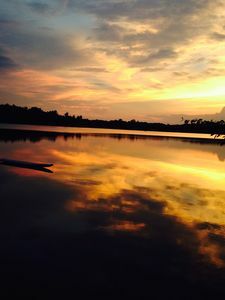 In the summer, come and enjoy the peaceful sounds of the loons, as well as canoeing, kayaking, sailing, fishing, jet skiing, motor boating or simply swimming in the clear lake water. Our lake features a full service marina. Sit on the beach or the dock relaxing and taking in the sun, or playing bocce on the beach. A top rated golf course (Province Lake Golf course) is only 10 minutes away. In the evenings, make a fire on the beach and roast marshmallows under the starry nights! In the winter, wonderful sledding in the back yard, ice skating on the lake, or snowmobiling trails through the area, as well as numerous ski resorts within as little as a 25 minute drive of our cabin. And year round, the outdoor hot tub is a wonderful place to relax and talk with your family or friends. Open to Vacation Exchanges: We love to travel -- my wife Donna of 26 years, our two daughters (ages 17 and 13) and perhaps our oldest daughter (who is out of college and not able to travel as much). We love warm locales (Hawaii, Florida, California as well as Europe. We can also do non-simultaneous exchanges. Tempt us!! 2 Bedrooms - one with queen size bed, the other with 2 twins beds. Pull out couch and 2 sitting rooms. Cable and WiFi. The bathroom has a walkin shower, toilet and single sink along with another shower outdoor. Big waterfront patio with NEW patio furniture , NEW fire pit and gas grill. Waterfront deck off of the master bedroom overlooking extremely clean water and a 30 ft dock(up until Columbus wknd ). The marina is a very short walk with pizza, beer, wine and penny candy. The marina sells gas for your boat. As always any questions or concerns please feel free to contact me. Absolutely- No pets or smoking allowed - no exceptions. *Please see note section for additional information. Grand View Home overlooks the lakes region, minutes to Wolfeboro! There are homes with great views, then there are homes with Grand Views! Perched on the edge of Copple Crown mountain, this home offers breathtaking views of the entire lakes region and mountain range and only minutes to downtown Wolfeboro. The home is located on 100 acres offering your family and guests privacy and plenty of room for adventure year-round! With ATV and groomed snowmobile trails connected to the property, your adventures can take you to every corner of the state. Downtown Wolfeboro is only minutes away offering fine dining, coffee shops, and shopping and throughout the summer months you can enjoy live music or movies in the park. Grand View home is 3,500 sq ft and tastefully decorated with a warm mountain and cottage feel. A large wood burning fireplace located in the great room will be the center piece for any gatherings with plenty of room for seating and an open concept kitchen. Each of the 5 bedrooms offers a different view of this picturesque property. First Floor Master: Mountain and lake views with an inviting master bed, offers a walkout to the furnished patio to watch the sunrise or set. First Floor Bunk room: Rustic bunk beds with a cabin feel that will make any kid (or adult) feel like they are in a real life adventure! First Floor Guest room: A comfortable full bed awaits with views of the mountains and woods Second Floor Guest room 1: Large room with magnificent views of the lakes and mountains. A comfortable window seat is the perfect spot to enjoy the view and a good book. Second Floor Guest room 2: Two twin beds with majestic views of the forest. Game Room: Two more twin beds are nestled in the corner of this room that also offers a Foosball table, seating for board games and a TV. There are walking trails throughout and plenty of room to park. 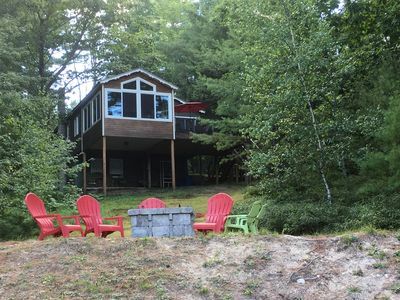 The driveway is approximately 1/2 mile long of meticulously maintained gravel road that bends and curves through beautiful New Hampshire terrain with granite boulders, maple trees and large pines decorating the drive to the top of the vast property. If you are looking for a vacation that offers serenity with the option for adventure, you have found the right home. We welcome you to Grand View for your next getaway and hope you enjoy making incredible memories with friends and family! Wonderful Lake Wentworth cottage features great views. Classic comfort and a simply superb locale are what you will get from this wonderful Lake Wentworth property! It is aptly positioned for direct access to the water, with a sugar sand beach just a quick jaunt from the back door and plenty of outdoor lounge space on a simple, convenient patio. Access the outdoors through sliding glass living room doors that also give you a panoramic view of the lake ideal for watching sunsets in the evening. The cabin itself features a warm and welcoming knotty pine interior, sprawling over 3 bedrooms and 3 baths. Vaulted ceilings in the living room area give this room great appeal, alongside a brick-accented stove. The kitchen features a spacious bar and connected dining area, made homely by the brick fireplace and wall-to-wall windows. No matter which room you are staying in, you willl have a clear view to the nights sky and perfect for catching the occasional shooting star or glimmering constellation. ABOUT THE LAKE HOUSE -------------------------------------------- We promise you won't want to leave. From the second you walk through the front door, the wonderful view of the lake welcomes you. This contemporary lake front retreat features everything you need for your summer or winter getaway. Private balconies overlook the lake from each of the upstairs bedrooms, the deck is ideal for grilling and enjoying breathtaking sunrises, sunsets, and nature views. Relax at night in the screen porch that overlooks the lake and fenced in yard. The home is bright and cheery thanks to endless views of the lake from every room in the house. The home comfortably sleeps 6 with 3 bedrooms (2 Queen beds and 1 Full size bed) and 2.5 baths, including the Master En Suite Spa with large walk-in shower and Jacuzzi jetted spa tub. Romantic Fall & Winter Weekend Getaways --------------------------------------------------------------------- With the large gas birch-wood fireplace, Master En Suite with Jacuzzi spa tub, and breathtaking views from every room in the house - the lake house is the ultimate romantic weekend getaway for two! When you get back in touch with nature, you'll also get back in touch with yourselves. Take the Kayaks out in the fall for a relaxing paddle on the lake. Fire up the grill. Relax on the screen porch. Watch the ducks, eagles, loons, and herons. Winter Private Retreat --------------------------------------------------------------------- Winter at the lake house is like your own private retreat. XC Ski, Ice Skate, Ice fish, Snowshoe, or take winter walks along the lake or on the trails of Plummers Ridge, just a 2 minute walk from the house. The living room features a large floor-to-ceiling stone fireplace with birch-wood-style gas logs and large flame for the look of a traditional wood fire, without the hassle. Across the lake is conservation land, guaranteeing unspoiled views from every room in the house. Spring, Summer and Fall! --------------------------------------------------------------------- You'll enjoy your own private dock, and have use of our 2 kayaks and 4 person pedal boat, but feel free to bring your own kayaks, SUP's, or boat. Kayak out to see the Eagles nest or sit and watch the ducks, birds, eagles, herons and boaters. Breathtaking views overlooking the 1100 acre Milton Three Ponds, and can spend the day exploring the lake as well as the Branch or Salmon Falls Rivers that feed into the lake. Relax on the deck, play a game of corn hole, take out the kayaks or pedal boat, have a cookout, or fall asleep in the hammock. 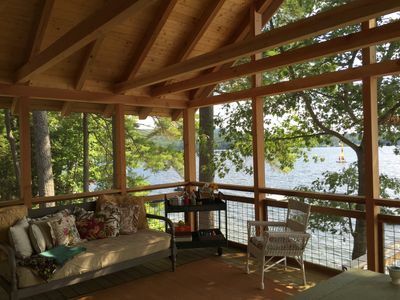 The lake side screen porch offers breezes and sounds of the lake day or night. When the temperature cools off at night start the fire pit or sit by the living room fireplace and relax and unwind with a glass of wine. Fire Pit --------------------------------------------------------------------- After the sun sets - start the fire pit, sit back and enjoy good conversation and toasted marshmallows. Fully Stocked Kitchen --------------------------------------------------------------------- Viking Professional Gas Stove & Oven. dishwasher, microwave, toaster, dual mode coffee maker (single serve or 12-serving brew), and trash compactor. Utensils, Glassware, cutting boards, knives, etc. are already here for your use and enjoyment during your stay. Whole House Generator --------------------------------------------------------------------- To ensure a great stay any time of year the lake house also features an automatic whole house generator. Our new deck spans the entire lake side of the house. Listen to the loons, watch the bald eagles, mallards, and Canadian geese each day as you relax and enjoy the lake breezes. At night, light the fire pit, grab the marshmallows and make some memories. (Fire pit: May - Oct). A large screened in porch provides outdoor enjoyment spring, summer, and fall . Eight ceiling fans throughout the house helps keep the house comfortable even on the warmest of days and to circulate the warmth in winter. Master Suite and Spa! --------------------------------------------------------------------- The master bedroom features an en suite spa with Jacuzzi jetted spa tub, double vanities, built-in dresser drawers, and a walk-in shower. The Jacuzzi tub is the perfect way to relax and unwind any time of year. The private balcony off the master bedroom overlooks the lake for late night star gazing or to relax with a cup of coffee while watching the colorful sunrises. The second upstairs bedroom also features a private balcony overlooking the lake. Each bedroom features all new (June 2017) furniture, super comfortable mattresses, and linens. The street side of the property is just as beautiful with three apple trees and a pear tree in the front yard, long gravel driveway, and a gate-style fence to keep wildlife and geese off the property. Laundry is also located on the lower level. Walk out to the picnic area underneath the deck or to the yard and private dock. Two kayaks and a pedal boat are available for you to enjoy during spring, summer, and fall. Fall Foliage is Spectacular! --------------------------------------------------------------------- Don't miss fall foliage on the lake. The lake is colorful and magnificent during foliage season thanks to unspoiled views of conservation land across the lake. Clean, Smoke Free Home --------------------------------------------------------------------- If you love a clean, fresh, smoke-free home and would like to fall sleep on the most comfortable mattresses anywhere, you should reserve your stay today at the Lake House. Maximum Occupancy: 6 --------------------------------------------------------------------- We love the lake and we fantastic neighbors, and would never want the sharing of our home to come between us. For the integrity of the property we enforce a strict limit of 6 guests that can be on the property during your stay. This also helps us keep the home as beautiful for our next guests as we do for you. 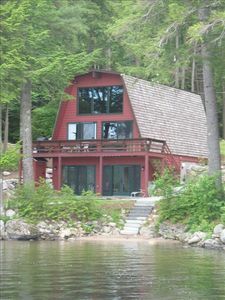 Year Round Lakefront House on Pine River Pond! 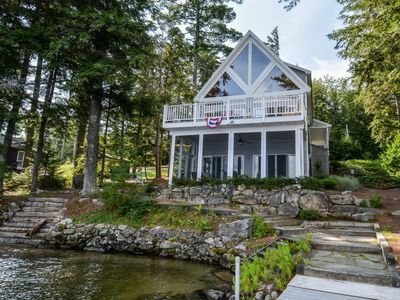 Peaceful waterfront retreat only minutes from Wolfeboro. Perfect Lake Retreat featured in Yankee Magazine. Newly Renovated in 2015! This charming cottage with whimsical decor has beautiful lake and mountain views. Lake Wentworth is a quiet 3000 acre lake known for its crystal clear water, sandy bottom and great fishing. 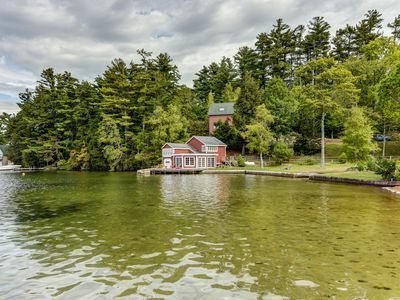 The location is private, yet you are only three miles from Wolfeboro, 'The Oldest Summer Resort in America,' and Lake Winnipesaukee. Decorated with antiques and 'shabby chic' style furniture, it was featured in Yankee Magazine's May 2006 magazine. There is a newly renovated kitchen, sun room dining area, and beamed cathedral ceiling and fireplace in the upstairs living room. A large deck with 2 seating areas is close to the water's edge, as well as a new vaulted ceiling screened porch that connects with the master bedroom and kitchen. The new first floor has amazing lake views from every space, all at the edge of the water! A second family room with fireplace, game room, laundry room and two new baths provide lots of space to hang out separately or together! A private dock and swimming raft are steps from the house. The house has four private bedrooms and sleeps 8. In the fall, enjoy the lakefront patio with portable fire pit table, or the two indoor fireplaces. 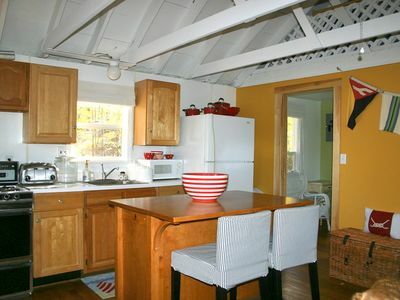 This is not your typical rental- it is perfect for a single family or several couples. PLEASE message me before renting- I will not accept any rental requests made directly on line without communicating with potential renters. Do not just vacation at Lake Wentworth - preside over it! This truly unique and imposing contemporary home is set right on the lake, offering beautiful views from no matter where you are standing. Sit idly on the screen-in porch and take in the fresh air or walk out onto the dock to gaze at the expansive vistas of the woods around you. Or, take in the view as you sit working at the desk in the loft, which gazes out through beautiful architecture and vaulted ceilings. When you are not admiring the ambiance of the lake, lounge comfortably throughout this 3-bedroom, 3 bath home. Its warm, knotty pine interior sprawls over a modern, spacious kitchen, open-concept dining room, and a well-furnished den. The lower level is open and large enough to accommodate 10 comfortably, with direct access to the porch through sliding glass doors. NEW! Waterfront Belleau Lake Summer Cabin w/Dock! This remarkably private 4-season home is situated on its own secluded peninsula! Enjoy 600 feet of waterfront on this 1.2-acre level landscaped lot on Sunrise Lake. The home is situated at the end of a dead end street and has a gated drive. Southwestern exposure ensures that you will enjoy plenty of sun all day long. There is plenty to do at this tranquil retreat. 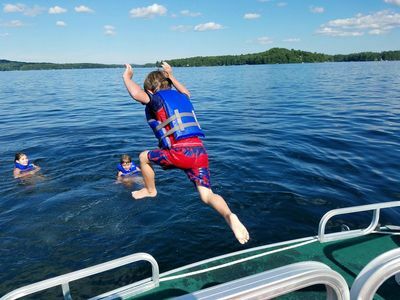 Swim to the floating dock while the little ones enjoy playing on the private sandy beach or take one of our kayaks – or your own boat -- from the end of the private boat dock and explore the 250-acre lake! Enjoy fishing, swimming, water skiing, tubing, jet skiing, kayaking, hiking, or just soaking up the sun on the spacious deck. We provide you with two kayaks, a paddle board, a row boat, life preservers for the whole family, and floating loungers. We also have four wooden lounge chairs, two Adirondack chairs, two large umbrellas, a hammock, and a swinging bench on the beach for those who just want to sit back and relax. In the evening, enjoy a family cookout using our brand new Weber propane grill before gathering around the fire pit and roasting some marshmallows. Perhaps you can get in one last game of bean bag toss on the spacious, mossy side yard while watching the sun go down! With all the outdoor fun, we forgot to mention the splendors of the house! The entire home has been recently renovated and has 3 spacious bedrooms, two bathrooms and water views from every room. 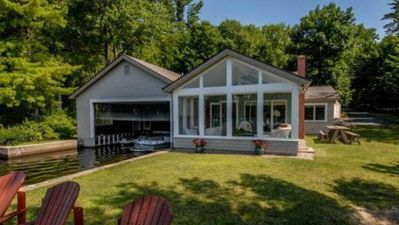 Relax in the sunroom with its high ceilings, wood paneling, sliding glass and screen doors, and sweeping views of the lake. The living room has a large, plush sectional, big screen TV and a new wood pellet stove that heats you up on those colder nights. The modern kitchen is fully equipped with everything you need and is adjacent to the dining area with seating for six to eight. The master bedroom is on the first floor, directly across the hall from a full bath. On the second floor, there are two more bedrooms as well as another large bathroom. To make it feel like home, we provide plenty of pillows, fresh linens and towels for the shower and outdoors. While spring and summer are great times to enjoy the lake, our home is meant to be enjoyed all year round! 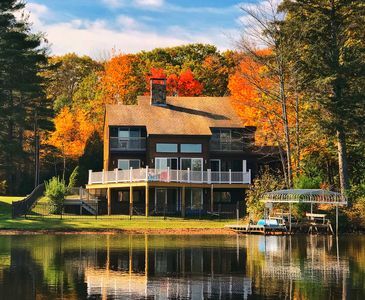 The area is renowned for its brilliant autumn foliage and, with undeveloped forest views, what better place to do some leaf peeping than from the warmth of the sunroom overlooking the lake? In the winter, take your snowmobile on the nearby snowmobile trails, venture out onto the frozen lake with your skates, or drive to Gunstock for some night skiing! With Middleton’s close proximity to the lakes regions’ most popular tourist destinations, the options are endless! We take pride in our home and we are excited to share it with our guests. We hope to see you soon! This lakefront cabin has the added benefit of having the privacy that others don't. 75 feet of your own private beach in a secluded cove gives you an opportunity to truly relax and enjoy the beauty of Sunrise Lake. Explore the lake in one of our provided kayaks, stand-up paddle board, canoe or paddle boat. Visit the Loons or keep an eye in the sky for a Bald Eagle. Spend the day with your family and friends in and around the multiple islands. Enjoy the relaxation! Private beachfront property in secluded cove! : This property offers a private retreat for you and your family to enjoy! Paddle out to the islands for some blueberry picking, spend the afternoon swimming and fishing, grill up your dinner on the deck as the sun sets over the lake, or you can just relax on your private beach and enjoy the sun and quiet! Be sure to have your camera ready as the Loons like to visit the cove! If you prefer, play some golf on one of the local beautiful courses and then drive into Wolfboro for shopping and dinner on Lake Winnipesaukee! Whatever you decide, enjoy the relaxation! 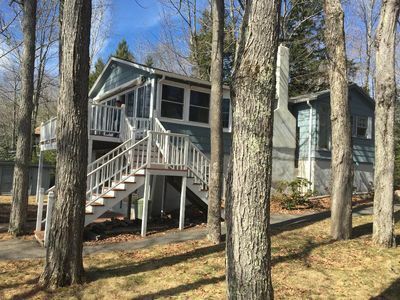 Welcome to 'Endless Sunsets' our 3 bedroom, 1½ bath year around home located on the east end of Sunrise Lake in Middleton, New Hampshire. Named Endless Sunset because the sunset views are spectacular as the sun goes down directly down the lake from us. 100 feet of private waterfront, with private beach, on the clear lake offers you a place to relax, fish, swim or boat literally at your back door... well, ok, at the edge of our tiered rear lawn. Right from our home you can easily enjoy fishing, boating, hiking, skiing, golf, picnicing, fairs, NASCAR racing or nature trails. PLEASE NOTE - DURING PRIME RENTAL MONTHS, JUNE THRU SEPTEMBER WE ONLY ACCEPT RESERVATIONS OF 7 DAYS, BEGINNING AND ENDING ON FRIDAYS. Equipped with the latest in electronics (TV's, stereo, internet access etc.) the entire home has been redone to accommodate all guests. Both of the main level bedrooms now have wall mounted fans and the living room has a stand up oscillating fan. From Fall foliage to spring and summer fun, this location has it all. We were completely booked for this past 'Summer Season' so if you are planning ahead for 2017 email us early to insure you get the week you want. WE ARE ALL BOOKED FOR 2018 AND HAVE ALREADY BOOKED FOR 9 WEEKS OF 2019 The week of June 21 thru June 28 had been blocked for my family and has now opened up as available.... it won't last Only a few weeks left for 2019 season Close to many of New England's scenic and fun spots and yet nestled in the quaint town of Middleton, you can do it all or nothing at all. Only 15 minutes from Alton Bay where you can board the 230 ft M/S Mt Washington to cruise Lake Winnipesaukee. The Mt Washington makes stops at Weirs Beach, Center Harbor, Meredith, Wolfeboro and Alton Bay. Enjoy their Sunday Champagne Cruise with or without a buffet meal, the cruise is great time at a reasonable price. Fall colors abound throughout the region and many of the areas offer true country fairs featuring crafts, foods and farm animals. The mountains are a photographer's dream with a huge spectrum of colors. This is a GREAT place to have family fun! Fall is the time for apple picking!!! TO SEE WHAT OTHERS THINK ABOUT OUR HOME MAKE SURE YOU CLICK ON THE REVIEWS SECTION OF THIS LISTING-- IMPORTATNT, I HAVE A DETAILED LETTER I CAN SEND YOU WITH ALL OUR RENTAL INFORMATION & REGULATIONS. WE LISTEN TO OUR GUESTS AND BECAUSE SEVERAL OF OUR GUESTS MENTIONED PROBLEMS WITH CELL PHONE RECEPTION IN THE AREA OF OUR LAKEHOUSE WE HAVE INSTALLED 2 LAND LINE TELEPHONES IN THE HOME AND OUR GUESTS MAY NOW CALL ANYWHERE IN THE U.S., CANADA OR MEXICO AT NO CHARGE (all other locations or calls are blocked). ANOTHER GUEST COMMENTED THAT THE PADDLE BOAT NEEDED ATTENTION, WE DID THAT AND BOUGHT A 2015 PADDLE BOAT, ENJOY! WE PURCHASED 3 MORE ADULT AND 1 MORE CHILD'S KAYAK. NOTE: Only a few weeks remain available in 2018..... HIS HOME IS ON SEPTIC AND NO MORE THAN 8 GUESTS ARE ALLOWED AT ANYTIME. PLEASE NOTE - THIS IS OUR HOME, NOT A CAMP OR CABIN. IT IS ON SEPTIC AND WE LIMIT IT TO 8 GUESTS (EITHER STAYING THERE OR VISITORS) AND 3 CARS. LAST SEASON WE HAD GUESTS BRING 14 PEOPLE AND 9 CARS WHICH CAUSED OVER $500 IN DAMAGES TO THE SEPTIC SYSTEM. I RETAINED THE SECURITY DEPOSIT. BEAUTIFUL VIEWS AND STUNNING SUNSETS AT THIS LAKEFRONT HOME!!! 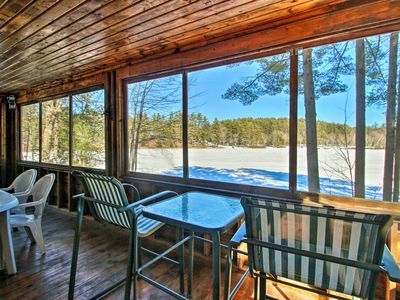 Sip your morning coffee from the screened porch overlooking the serene lake. Relax morning through evening on the lake front deck that enjoys spectacular sunset views. Swim and fish off the dock in warm lake waters. 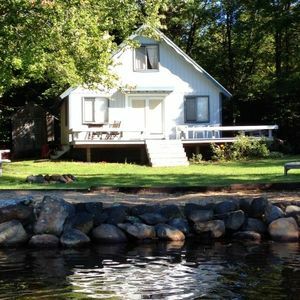 Our 3-Bedroom year round home sits on the shores of peaceful Belleau Lake. You will be amazed at how open and spacious, yet warm and inviting our home is. When you walk through our front door, you will enter the fully equipped kitchen, which is sure to meet all of your cooking, baking and serving needs. The open floor plan allows for the kitchen to flow into the dining area and living room. Great for family gatherings and entertaining! The living room and dining area boasts cathedral ceilings, with 2 large sky lights, allowing for the natural sunlight to spill in. The dining area seats 8+. The living room features a wood burning fireplace, a queen sleeper sofa and lots of comfortable seating, along with cable TV, DVD, VCR, & stereo. Stretch out on one of the two Yogibo bean bags. Off the living room are french doors that lead to the spacious screened porch and large deck overlooking the lake. Also off the living room is the master bedroom on the left, which features a queen bed and attached half bath. Another bedroom to the right, with a queen bed and twin cot. The washer/dryer and full bath are located between the two bedrooms. 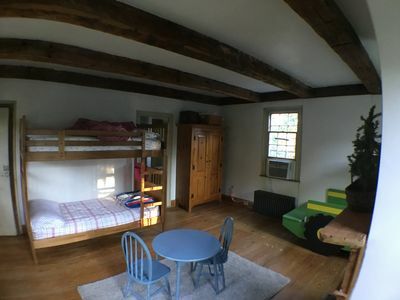 On the lower level is the third bedroom with twin bunk beds and a futon that sleeps 2. There is also a large family room with pool table, Foosball table, dart board, bar, pellet stove, sitting area with queen sleeper sofa and chair. Walk-out to stairs leading to the deck with patio furniture and dock for swimming and fishing from. We also provide 2 kayaks, 1 stand-up paddle board and life jackets in many sizes. Vachon Beach, which is a private beach for lake residents, is located just a short walk away. For the times when you just don't feel like cooking, there is the Blue Bay Seafood and Steaks Restaurant and Bar less than a half mile away on Province Lake Road. Plus Jim's Wheelhouse Pizza in the same area. The Knotty Pine Restaurant and Poor People's Pub are 10 minutes down the road. There is also the Country Goods and Groceries store less than a half mile away on Province Lake Road, which sells pizza and subs and has all of your grocery needs, along with beer and wine and some of the best ice cream in the area! The New Deal grocery store and gas station is in the same area. If it's a great breakfast you want, try Cindy's just across the street. The lake isn't just for summer vacation. There are many antique shops to explore, fresh fruit to be picked at local farms, leaf peeping in the Fall and skiing, sledding and snowmobiling in winter. These all make for fun family day trips and memories to last a lifetime. We are approximately 45 minutes to North Conway. There, you can shop the many outlet stores, and other local hand-craft, antique and gift shops, ride one of the area's scenic train rides, visit the many family attractions, such as Story Land and Santa's Village, and ski at one of the many resorts in the area. If it's golf you enjoy, Province Lake Golf Course is just a 10 minute scenic drive away. There you can enjoy a round of golf, then dine at The Restaurant at Province Lake Golf located in the clubhouse. For those who have snowmobiles, Belleau Lake is located on Corridor 19, which links you with trails throughout New Hampshire, Maine and Canada. You can travel to North Conway or Lake Winnepesaukee for the day! Come enjoy our home away from home, create wonderful memories and see why we fell in love with peaceful Belleau Lake. This home sits on a private 1-acre wooded lot overlooking beautiful Belleau Lake. The front door leads to an open concept kitchen/dining/livingroom, which gives an expansive feel to the space. The home features wide-pine wood floors throughout and a chalet-style living room with floor to ceiling windows overlooking the lake. This lake accepts motor-craft, so come and park your boat on your private dock for a week of fun. The kids will love the sandy-bottom swimming area. Relax in front of the fire pit while watching the boats drive by. This home can comfortably sleep 8, with all rooms located on a single level. The Master Bedroom contains a queen size bed; 2nd Bedroom is a bunk room with two sets of twin size bunk beds; additional room also contains a queen size bed. ***Updated kitchen coming Summer 2019 ***Please note that this property is a pet-free, non-smoking facility both inside and outside. ***Please also note that there are no interior cameras on property and there never were. There is an out-dated, non-working temperature sensor that has been covered up as to not be mistaken for a camera. This will be removed by a licensed electrician during the kitchen update Winder 2018. 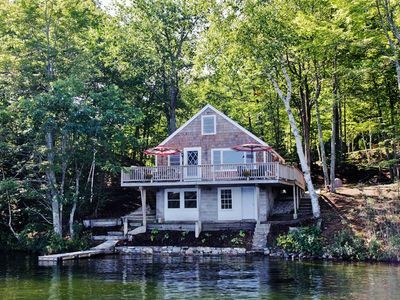 Our beautiful and spacious Lakefront home has over 100 feet of sandy, private beach on a quiet cove in East Wakefield, New Hampshire. 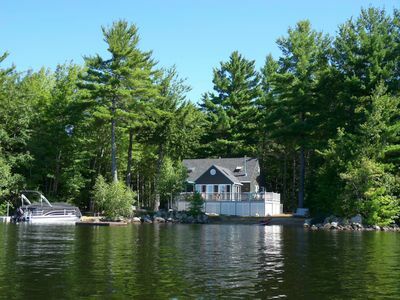 Located on the lovely Belleau Lake, our all season home provides a home away from home. As you first enter the Main Floor, you are welcomed into our open concept Living Room and fully equipped Kitchen, surrounded by windows for a full unrestricted view of the beautiful lake and mountainside. This large room has a glass propane fireplace, seating for 8 at the kitchen table,5 at the breakfast bar and includes a full kitchen with refrigerator, double oven stove, dishwasher, microwave, coffee maker, toaster, cooking utensils, baking pans, and spices too. With four private sleeping areas and lots of extra room for non-private sleeping quarters, our New Hampshire Getaway can sleep as many as 14+ people. On the Main Floor, there are two private sleeping quarters with Queen Beds and a Master Bedroom with two King size beds. The Master Bedroom has its own private deck and propane wall fireplace. The Living Room has a couch that will convert to a full/queen bed. Downstairs, there is another private sleeping area with two single beds and a queen size trundle bed with glass sliding doors overlooking the lake. The downstairs Family Room has a 2 single beds, and 2 cots. The Family Room also has sliding glass doors to the lakeside patio. The Game Room is right off the Living Room and has an Olhausen Pool Table, Dart Board, Bar, TV and propane fireplace for relaxing and having fun. New Flat Screen TV's in the living room and master bedroom. Both the Living Room and the Game Room open up to the 15’ x 24’ Deck with a BBQ Propane Grill. Come, sit on our Deck, and relax while you gaze at the beauty of the lake or the amazing sky on a clear and starry night. On the Main Floor, there is a full bath and downstairs is a ¾ bath with a shower, a washer/dryer for convenience. There is parking for multiple cars, filtered water, a music system, Cable TV, DVDs, games and Wireless Internet. We have just installed the new “Roku” streaming video player in the living room. Movies, news, weather, games – the designer TV. 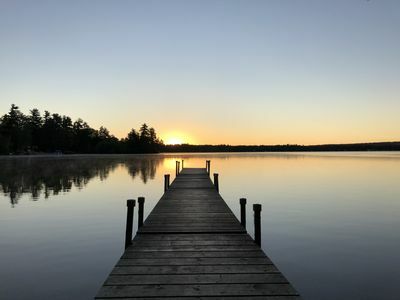 Outside you can enjoy swimming; fishing off the dock (Belleau Lake is well known for its abundance of large mouth bass, perch, and sunfish) or just relaxing in the sun. Bring your canoes, kayaks, floats and enjoy the crystal clear lake. There is plenty of open space to play your outdoor games. At night, make a fire in the fire pit and roast marshmallows under the stars. 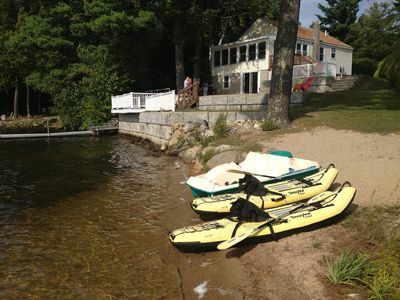 You can rent a boat,kayak, canoe or Jet Ski and have it delivered to the lake from Everett Cove Marina in Lebanon, Maine. Within 1 hour you can be hiking the White Mountain Forest, canoeing down the Saco River, or shopping in North Conway. Try your hand at mountain coasting at Mount Cranmore or Attitash. Play miniature golf in North Conway. Lake Winnepausaukee, Weirs Beach or Saco, ME are within a 45 minute drive. Don't forget about the beautiful scenic views in the area. Why not take a drive along the beautiful Kankamangous Highway or Bear Notch Road or take a hike thru Rocky Gorge or up to the famous Sabbaday Falls. Don't forget to check out Castle in the Clouds about 30 minutes away. During the winter months our resort provides all the amenities of a winter wonderland. Picture a toasty fire inside with the snow-covered lake as a backdrop. Ample cooking area, with built in entertainment of a pool table and cable television. Within an hours time you can be skiing at mountain resorts like Gunstock, Attitash and Cranmore. The family oriented King Pine Ski Area, about 40 mins from our home for famiy skiing, tubing, ice skating and ski lessons. Enjoy snowmobiling? 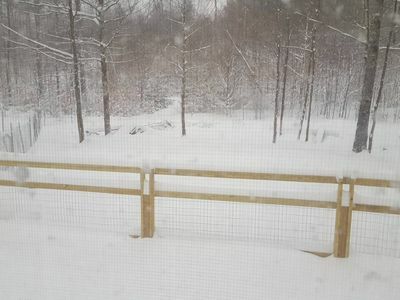 Start your engines and access snowmobile trails right off out land from the house. No need to spend time and money hauling your machines to a trail destination. We are located on Major Trail 19! It's a winter wonderland with adventure at our door. We are minutes away from many NH attractions. Thirty minutes to the west is Wolfboro, Laconia, Weirs Beach, Castle in the Clouds, and the Lake Winnepesaukee area. In an hour you can be at Wells Beach, Ogunquit, Kennebunkport, in Maine on the Atlantic Ocean to the east. In less than an hour heading north is the picturesque Kancamagus highway, Storyland, Jackson and the North Conway shopping outlets. Outstanding skiing at Attitash and Mount Cranmore to our north. Come and Enjoy the peace and privacy of our beautiful Lake House Getaway! 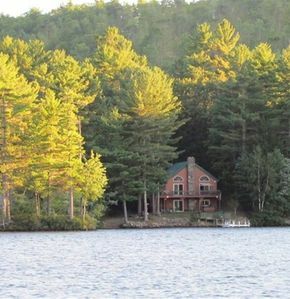 Come relax at this cozy lakefront cottage on Sunrise Lake. 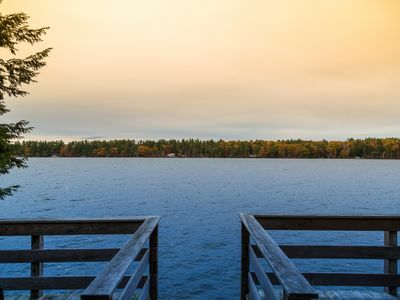 With a private dock and beach you can experience mother nature’s peacefulness by listening to the loons, watching for eagles, boating, swimming, and fishing. The huge wrap around deck overlooks the large yard and sandy beach which is great for children. Cottage is set back off from the road in a private setting offering true peace and quiet. Open concept kitchen, dining, and living room. Two bedrooms, two baths, and two pull out couches. Washer/dryer, grill, TV, and internet are all some of the great amenities this property has to offer. Dog friendly, no smoking. Two kayaks available for use. 10 miles to Wolfeboro. 35 miles to Portsmouth. 50 miles to North Conway. 90 miles to Boston. 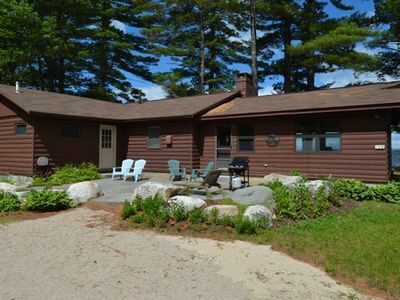 This ten year old property is located on the sunniest side of Sunrise Lake in Middleton NH. This beautiful property is situated on 100+ feet of private sandy shore. You will be able to boat, fish, swim, and soak up the sun and enjoy the views of this wonderful Lake. With its shallow and sparkling waters, kids can swim, build sand castles, kayak, pedal boat and keep cool in the lake water. Also enjoy beach volleyball, horse shoes, shoot some hoops or try your luck at ping pong. At night sit by the fire pit on the beach and roast marshmallows to make some s’mores while counting the stars. Endless activities for you and your family all in one spot. It’s like you are in heaven! 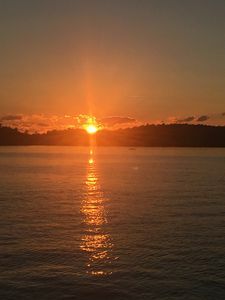 If you like to adventure out, we are not far from Lake Winnipesaukee (Alton Bay, Wolfeboro and Weirs Beach), hiking at Mount Major, Zip Lines and hiking at Gunstock, movie theaters and many golf courses. The property has spectacular views of the Lake upstairs and down, a modern kitchen with all your needs to cook, 2 full bathrooms with an awesome outdoor shower. There are 2 main TV areas and a beautiful brick bar to hang around and play games. The property can sleep 8 with 2 bedrooms (3 additional futons and bunk beds) and is equipped with a washer and dryer and 2 Bose entertainment systems. The second floor deck has 2 large patio tables that can sit 10 and a grill that is large enough to cook for your entire family. The views from the deck overlooking the cove are spectacular. At times you will see the hawks overhead looking for pry, the loon diving for a snack or the ducks enjoying the water looking for their next place to rest. If you have a boat, bring it with you. You can launch it from the beach and keep it at the 28 foot dock. There is plenty of room in the driveway for your vehicles and trailers. If you like fishing, then this is your place. From land or Lake the bass are plentiful. Fish from the dock or beach and you will not be disappointed in what you may catch. For the little fishermen in your family, there are plenty of sunfish and perch to keep them busy all day. VISIT SUNRISE LAKE IN MIDDLETON NH. HAVE FUN! ENJOY AND MAKE MEMORIES! Spring, Summer, Fall and Winter = Peaceful and Easy on Belleau Lake. 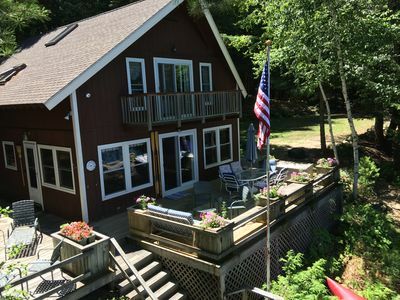 The Cottage includes a fully equipped kitchen, washer and dryer, great-room with dining area which opens to the large deck overlooking a private dock for your boat and spectacular sunsets. You'll love the view from the Master through the French doors. 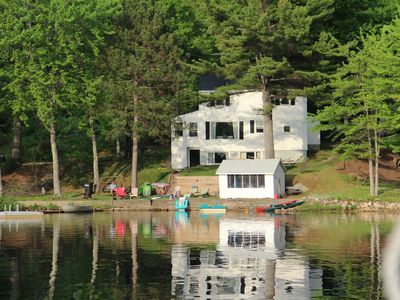 Enjoy fishing and swimming from the dock in summer, foliage and fairs in fall and all the winter activities the lakes provide. Golf and restaurants are nearby and shopping and hiking are within reach. This is a perfect location from which to explore the region or to simply get away. You will leave feeling refreshed and renewed. Suitable for families or couples. Minimum age for renters. No smoking on premises. No pets. 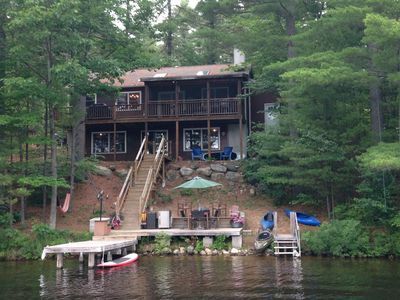 Beautiful waterfront property minutes from the heart of Wolfeboro on Rust Pond. Peaceful setting on pristine, super clear water. A wall of windows and screened porch help you enjoy the sights and sounds of the water. Swim or kayak from the dock to a sandy beach Get a work out paddling the circumference. Any way you like to enjoy it, come back to a cozy place to wash off and relax. The home offers four bedrooms and two full baths. The eat-in kitchen is fully stocked, overlooking the water and connected to a large deck for grilling, dining, and sunset viewing. The upper bedroom includes a queen bed and a surround of windows plus a large closet. On the main level you will feel the coziness of the original 1930's cottage featuring a 1 bedroom/bath alcove. Next, the lower lake level. Renovated in 2017 more modern amenities can be enjoyed. One of the newly renovated rooms has 2 sets of bunk beds. The other a queen with a large walk-in closet. Both bedrooms feature beautiful walk-out views of the water. The large brand new bathroom on this level has a 60" X 42" shower and a double sink vanity. Exit this level to the brick patio just a few steps from the dock. 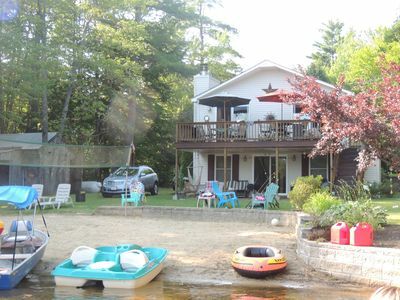 Year-Round Home with access to Beautiful Sunrise Lake, Beach, and Winter Fun! This property is a wonderful ranch home. There are two bedrooms with open concept living room/kitchen area. Cathedral ceilings with exposed beams. Radiant heated floors throughout for those chilly mornings and nights which make it rentable year-round. It also has a pellet stove to add to the peacefulness and comfort of your stay. In the fall, come to New England, stay in the area, take a weekend break and enjoy the vibrant colors of the leaves and all the fall season has to offer. In the winter come snowshoe, snowmobile, or head to the nearby ski areas. It is a stone's throw away from the beautiful, clear, sandy bottomed water. A great place for the kids to play, get in your kayak, or just sit and relax. 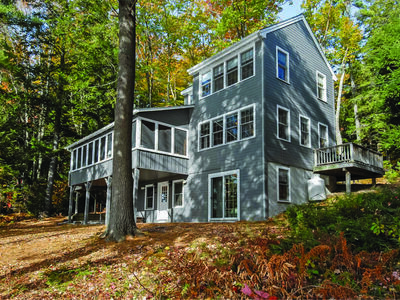 This home is centrally located to ski areas, the ocean, Lake Winnipesaukee, the White Mountains and access to nearby snowmobile trails. Nellie's View is located on pristine Rust Pond in beautiful Wolfeboro, New Hampshire. It is a private 850 SF home, recently renovated and newly furnished. It has a full eat-in kitchen with a half bath, a large and comfortable living room, and a luxurious master bedroom with a sitting area and an en-suite full bath. There are fun birch bunk beds for the kids, a memory foam sleep sofa, and a queen bed in the master. All rooms have wonderful lake views! Sliders in the living room connect to the large upper deck with multiple seating areas and a gas grill. Steps down lead to the waterfront decks, dock, and swimming area. 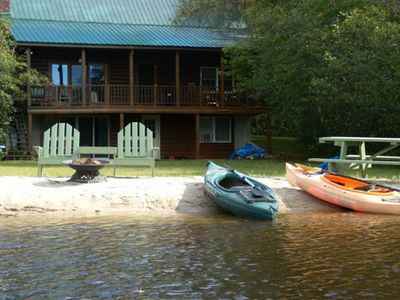 Kayaks, stand-up paddle boards, a canoe, and a sailboat are available for our Guests. Our neighboring property, Grey Shingles Camps, is a 5 acre property with an additional 5 camps and a Rec Hall. Nellie's View, although private, has the advantage of enjoying all the amenities of Grey Shingles Camps. These include basketball, pickle ball, volleyball, badminton, horseshoes, corn hole, campfires in the orchard, and a sandy beach with the afore mentioned watercraft. The Rec Hall has our Reception Desk, a living room with a large screen cable TV, ping pong, foosball, games and puzzles, a screen porch, and a new full kitchen for Guest use. Wolfeboro holds the claim of being "The Oldest Summer Resort in America"! The downtown area is about 1-1/2 miles up the road and is located directly on Lake Winnipesaukee. 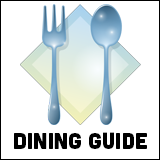 There are several groceries and wonderful bakeries, and many terrific restaurants offering various cuisines. There are art and craft galleries, clothing and home decor shops, and lots of yummy ice cream! There are boat rides on Winnipesaukee, and 4 museums offering local and international history, boating, and natural history. We can't say enough about our home town! Possibilities are endless for fun day trips including hiking, fishing, antiquing, and other local sightseeing. Additionally, North Conway and the White Mountains are an hour north, an easy day trip from Wolfeboro. Portsmouth and Kittery, Maine are about an hour as well. We hope you will come and enjoy a peaceful, relaxing, and fun stay at Nellie's View! We are open seasonally from May until mid- October. We live at the Grey Shingles Camps property year round, and will be available to assist as needed to help make your stay memorable! 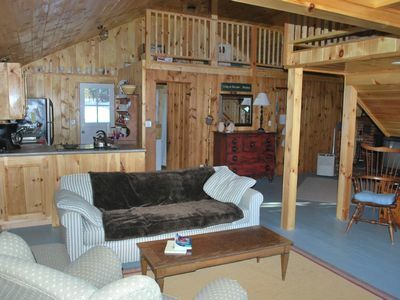 This lovely year-round chalet is situated in the Lakes Region of New Hampshire. 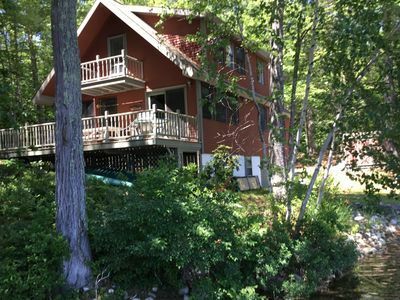 It is perched only 20 ft. from private waterfront on crystal clear Rust Pond. Rust Pond is a quiet 210-acre pristine lake in South Wolfeboro, 'The Oldest Summer Resort in America.' From the master bedroom balcony, you can see the morning sunrise, watch fish swim, or simply take in the serenity. Walking out on to the dock with your coffee, you may decide to slip in for a early morning dip, being the first to quietly pierce the clam water. Breakfast on the deck is a must. In the late summer you will smile at the mist rising above the surface, offering the warmth of the lake to the crisp morning air. Essential Info: 4 bedrooms all upstairs; 2- queen, 1 – double, 2 – twins. Half-bath on 2nd level. First floor as living room with gas fireplace, eating area, kitchen, full bath with shower, laundry. Large deck and lawn area adjacent to chalet. Hand paddle boats, dock, and raft. Pets allowed with prior approval and additional fee. Guests provide their own linens. Linens are available on request for an additional fee. Rust Pond is noted for great bass fishing. 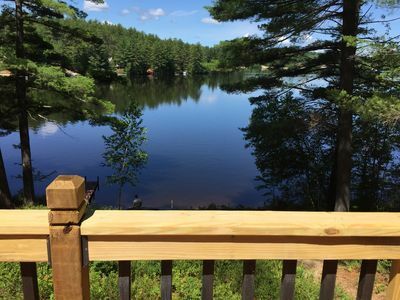 From the Chalet, a short walk along the Middleton Road and up Alpine Meadows will reward you with the most amazing view of Mount Major and Lake Winnipesaukee. 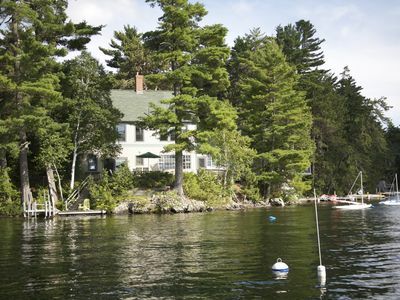 The chalet is 3 miles from the center of Wolfeboro and Lake Winnipesaukee. There is a great walking path along the old railroad starting at the Wolfeboro depot and proceeding along Crystal Lake and Lake Wentworth. There is a new dog park at the “NICK”. There are abundant restaurants, grocery, and specialty shops. Our family loves the ice cream, crepes, shoe store, jewelry, the local library, and a hidden gem, the Wright Museum. Lake Winnipesaukee Golf Club is near the Kingswood Regional High School toward the center of Wolfeboro. The Mt. Washington Cruise Ship offers sightseeing trips of Winnipesaukee from the Wolfeboro docks several days a week. Castle in the Clouds is another great take for the view, lunch or horse back riding. There are 3 golf courses within 10 miles: Enjoy New England at it's best. The Kancamagus Highway and the White Mountains are only an hour's drive north. 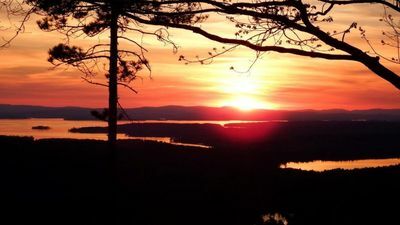 Mount Major in Alton offers a great day hike for families with the reward of stunning views of Lake Winnipesaukee and the Presidential Range. Story Land is an hour north if the kids aren't exhausted by swimming and playing outside all day. The the Conway outlets are an hour away if school or holiday shopping is on your agenda. Antique and yard sale expeditions are always an option if you want a change from your beautiful lake surroundings. This is a fabulous spot for the fall burst of colors and a fresh crispness to the air. Come see why our family has been enjoying Rust Pond for 4 generations. An opportunity to live on a farm without the work! Property has long respectable history dating back to late 1770s when it was one of the original tavern in the area for settlers and travelers. Your accommodations include 2 bedrooms upstairs with a queen in the master and 2 singles in the other separated by the full bathroom with tub shower. Downstairs is a cozy family room, lovely eat-in kitchen, formal dining room, and another bedroom with a queen. Wake up to mountain views and sounds of animals! Horses, donkey, alpacas, chickens, turkey, pigs, goats, and sheep all wait to meet you during your stay. Children will enjoy the play area with swings and large sand box. The primitive area is always a hit along with pony rides, Chugger the Train rides, hay rides and more. Purchase farm products from the store for your meals! The house is equipped with everything you need to feel like you're home away from home. Enjoy the many area attractions, area public beaches, many shopping opportunities, and close by essentials such as gas and grocery store. If relaxing is what you're searching for, relax in the hammock with mountain views! If exploring is on the agenda there are many hiking and biking trails. We look forward to meeting you! 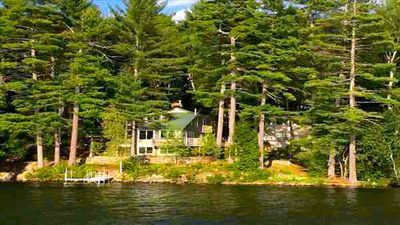 Wolfeboro Lakehouse retreat in the woods! Rust Pond is a small, beautiful lake in Wolfeboro. We are one hour north of the ocean and one hour south of the mountains- and we are in the heart of the lakes region! Our small private pond (it’s more of a small lake) empties into the big lake Winnepasaukee. Many visitors choose the quieter choice over the big lake because it’s so peaceful here! In the fall Wolfeboro is beautiful- and the drive up to the mountains is spectacular!!! We are also a great spot for skiers! Rust Pond is pristine- the water is crystal clear. We are renting out an apartment situated over a workshop/garage. There are two floors- the first is an open living room/kitchen with one bathroom. Upstairs is a one large room with two twin beds and one queen bed. The apartment sleeps four but if you choose to bring an air mattress it will sleep five. The owners home is down the hill- you will need to walk past the main home to get to the water. 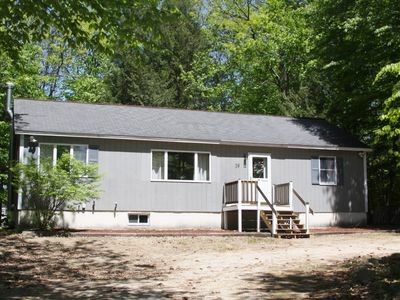 NOTE Link.to.my photos Link to Photos: Highlight address - right click - copy - paste in web browser: https://photos.app.goo.gl/SNEQPMtPsYPD8uSC3 Milton, NH waterfront 2 bedroom home with 2 bedroom in-law-apartment. This home with the in-law apartment makes it special because you can rent the whole house with family or friends and have total privacy. Home features an open concept floor plan, floor to ceiling windows, laundry facilities and a beautiful deck overlooking the lake. Also has 2 private decks off each bedroom. Downstairs home features an open concept floor plan, modern kitchen, dining room and living room with 3 glass doors to lake. This area sleeps 5. Outside amenities include a private dock, firepit, gas grill and patio furniture. This lake is stock for great fishing. With this 125ft driveway you'll have plenty of room for parking cars and boat/jet ski trailers etc. Also rental available for jet ski, waterskis, kneeboard and tube for tubing. On the lake is a mariner to purchase gas and also has rentals for a platoon boat and jet skis and a ice cream shop. This home is located off Spaulding Turnpike, Exit 17. This home is on a dead end street with great neighbors. Close by are golf courses and ski diving. Travel South 35 minutes to Portsmouth for fine dining, theatre, outlet shopping and Water Country the biggest Waterpark in New England. Travel North 1 hour ride to North Conway for hiking and outlet shopping. You can bus or take a train for a great day visit to Boston. or just drive in takes about 1 1/2 hours. My home is great for small children as the lake is not deep which makes it enjoyable to relax while your children are in the water. Spacious 3BR New Durham House w/Wraparound Deck!